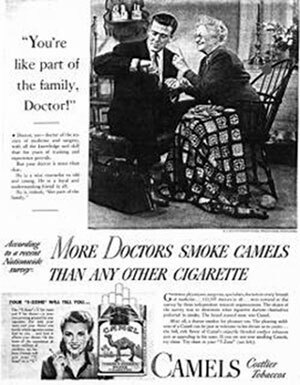 Camel cigarettes had the largest booth at American Medical Association's 1948 convention; boasting, "More doctors smoke Camels than any other cigarette." which is a splendid example of "Profits Not People" and should be a 'Wake Up Call' for HONEST Evaluation of the Dangers and Hazards from Cellular Telephones and effects of amplified microwave frequencies emitting from Cellular repeater sites. -- "It's A Matter of Trust" = Citizen's Against Second Hand Cellular Phone Radiation (CASHCPR), 2004, 2005, 2006, 2007, 2008, 2009, 2010 - Inspired by "edge Wireless", member of the [Spying] AT&T Wireless Network. Proof Corporatist and the FDA Support "Profits Not People"
May Be Harmful To Your Health? Cell Phones Affect The Brain: Disinformation or Not? Ever since amateur radio operators started using 70cm (440 MHz) there has been an ongoing conversation on 'fried brain or not'. Understanding the workings of this digital octopus starts with Cellular Telecommunications and Internet Association who hired former Rep. Steve Largent (R) of Oklahoma as its president during 2003. We've all heard the phrase "follow the money" if one wants to learn something, but in this case, we'll follow the Politician. 1996 - Bob Barr (R-GA) and Steve Largent (R-OK) introduce Anti-Gay / Lesbian H.R. 3396, "Defense of Marriage Act,"
1. who are the drug cartels within the southern Mexican state of Chiapas? 2. How many tons of cocaine and heroin have been confiscated and destroyed within the southern Mexican state of Chiapas? 3. Who are the US backed paramilitaries within the southern Mexican state of Chiapas? 4. How much funding do they get from the federal government? 5. How many members of the SOA are present within the nation of Mexico? 6. How many combat troops are on the ground within the southern Mexican state of chiapas, and the nation of Mexico? 2003 - Republicans take over K Street By Gail Russell Chaddock | Staff writer of The Christian Science Monitor "Most of the recent new hires in the lobby shops along the K Street corridor, and especially the top ones, have been Republicans, many from the Bush administration and Capitol Hill. Last week, the Cellular Telecommunications and Internet Association hired former Rep. Steve Largent (R) of Oklahoma as its next president. Getting the Picture?...Someone who hates individual sexual preference, Gays, Lesbians, and reminiscent of Brown Shirts is now the president of an organization that is going to tell you if cellular telephones are safe. During 1993, a Florida man filed a lawsuit claiming a cellular phone had caused his wife's brain tumor. In an act of "Profits Not People" and the fear of massive law suits, Cellular Telecommunications Industry Association (CTIA) established Wireless Technology Research (WTR) to research effects of cellular phone use. WTR indicated 'there may be several health problems traceable to radiation exposure due to cellular phone use; but, the Food and Drug Administration does not seem to agree. In this Press Release CTIA urges (lobby money?) the FCC to adopt a new compromise proposal on 800 MHz and grants Nextel more spectrum at 2.1 GHz. The importance of the sentence is 800 MHz and 2.1 GHz. Before getting into frequency, one should know a little about Harmonics; where, frequency is f, and harmonics are 2f, 3f, 4f, etc. 0800 MHz = Cellular Phone = Third Harmonic = 2400 MHz or 2.4 GHz = Same as 'base' frequency of a Microwave oven. 2100 MHz = Cellular Phone = Third Harmonic = 6300 MHz or 6.3 GHZ = More than two times of a Microwave oven. Rather than take you into the technical, let's see what the American Radio Relay League, Inc., a long established trusted organization, has to say. Reprinted from April 1994 QST, copyright © 1994 by the American Radio Relay League, Inc. All rights reserved. This material may be reproduced for noncommercial use, provided that QST and the original author are credited. Are the electromagnetic fields generated by power lines, TVs ham radio gear and hundreds of other devices bathing us in damaging radiation? The jury is still out, but you can take steps to protect yourself from danger--real and potential. There is a growing public debate about the safety of electric power lines and the electrical equipment that we use every day in our homes and workplaces. Not long ago, a lawsuit was filed alleging that a Florida woman's brain cancer was caused by electromagnetic radiation from a hand-held cellular telephone. Although the filing of a lawsuit proves nothing (thousands are filed every week, and this one was promptly dismissed by a court), the lawsuit made national headlines for weeks and caused cellular telephone industry stock prices to decline on Wall Street. The news media regularly cover many facets of the controversy over the possible health effects of electromagnetic fields (EMFs). In addition to stories about lawsuits, there have been numerous media accounts of medical research concerning EMFs--some of them confusing and seemingly contradictory. And there have been news stories about activist groups fighting the construction of new power lines or cellular telephone towers in their neighborhoods. This intense publicity has alarmed many people, prompting them to worry about the safety of their homes, neighborhoods, schools and workplaces. There is a growing concern that the electromagnetic fields produced by power lines and everyday household appliances may be hazardous. As the tension mounts, more and more hams are faced with this difficult question: Is your Amateur Radio station hazardous to our health? Fortunately, enough research has now been done that we know most Amateur Radio activities are quite safe. In fact, scientists from the Federal Communications Commission and the Environmental Protection Agency conducted a field survey of EMFs at typical Amateur Radio stations in 1990. They concluded that most amateur operations do not produce EMFs strong enough to pose any health hazard. And for many years, the American Radio Relay League's Board of Directors has also been monitoring the ongoing research about EMFs and health through a board-appointed Committee on the Biological Effects of RF Energy.1 There is extensive coverage of the issue of EMFs and health in both The ARRL Handbook and The ARRL Antenna Book--with recommendations for safe Amateur Radio operating practices. Amateur Radio is a hobby that can be pursued safely, provided everyone observes a few simple precautions. This article was written to summarize what we know about EMFs and health, and to suggest safe operating practices. When scientists talk about electromagnetic fields, they're talking about several very different forms of energy. Low frequency or "power-line frequency" fields are produced by electric power lines and appliances, typically operating at a frequency of 60 Hz. Much research is now underway concerning the health effects of 60-Hz fields--the kind of EMFs found in virtually every home and workplace. Additional research is being done to investigate the possible health effects of radio frequency (RF) energy, which is much higher in frequency than the electric energy in power lines. RF energy is produced by radio and television transmitters, radar installations, cellular and cordless telephones, microwave ovens and even remote controls for garage door openers. Low-frequency and RF energy are forms of nonionizing radiation: The frequency is too low to produce enough photon energy to ionize atoms. In contrast, ionizing radiation--which is not produced by power lines or radio transmitters--can cause severe and well-documented health hazards. Nuclear weapons produce enormous amounts of ionizing radiation, while small, carefully controlled doses of ionizing radiation are used in medical X-ray equipment, for example. The present controversy concerns nonionizing radiation, including power-line frequency and RF energy. Much is now known about the biological effects of this kind of energy, but there is much more that we do not yet know. Before World War II, scientists knew that non-ionizing radiation could produce thermal (heating) effects. At sufficiently high power levels, EMFs can cause body heating, which may result in health hazards such as blindness or sterility. Most ordinary household appliances and transmitted radio signals produce EMFs far weaker than those required to produce thermal effects. On the other hand, microwave ovens do generate EMFs strong enough to produce thermal effects: That's precisely why they can heat and cook food. The trick is to keep the EMFs safely inside the oven--away from people. For obvious reasons, microwave ovens must meet strict safety standards. In recent years, a new element in the debate over EMFs and health has been the finding that even at athermal levels--energy levels too low to cause body heating--electromagnetic energy appears to have various effects on the human body. The first scientists whose work in this area gained widespread media publicity were epidemiologists--medical researchers who look at the health patterns of large groups of people, using statistical methods. Over the last two decades, a number of epidemiological studies have found that electrical workers have higher-than-normal death rates from certain cancers, including leukemia, lymphatic cancer and brain cancer. Other epidemiological studies have shown that children living near some types of power lines have higher-than-normal rates of leukemia. Still other studies have concluded that persons exposed to certain chemical agents such as solder fumes in addition to high EMFs have up to 10 times the normal rate of certain cancers. All of these studies involved groups of people who were not ordinarily exposed to EMFs strong enough to cause body heating. Thus, their health patterns suggested that low-level EMFs may pose health hazards. There are other dimensions to this problem, too. Some of the research that failed to confirm a correlation between EMF exposure and health was funded by industry groups that have a financial stake in the outcome of the research. Critics have challenged the credibility of some of the research for that reason. Moreover, epidemiological research only reveals health patterns; it does not prove what caused those health patterns. If electrical workers have an abnormally high rate of certain cancers, that may result from their occupation--or it could result from something else. In short, the work of epidemiologists shows correlations without proving causation. That raises troubling questions without providing definitive answers. Responding to the questions raised by epidemiologists, a number of medical researchers have launched laboratory based studies of the effects of EMFs on living tissue. There has been an explosion of knowledge about molecular biology and the related field of genetics in recent years, and one of the focal points of this research has been the role of electromagnetic signals at the molecular level. Among other things, there have been studies suggesting that certain types of electromagnetic fields may alter the body's genetic makeup, causing chromosome damage. It is also known now that some EMFs may disrupt the flow of vital chemical and electrical signals between cells in the human body. EMFs appear to alter the passage of chemical and electrical signals through the cell membrane (the thin layer of material that covers each cell). This has caused some scientists to conclude that EMFs may sometimes affect the work of the body's immune system in fighting cancer. If the body's cancer-fighting T-cells fail to detect that a particular cell has become cancerous because cell-to-cell communication is disrupted by EMFs, that would increase the risk of a tumor developing. There is also laboratory research indicating that EMFs may inhibit the body's cancer-fighting ability in other ways. Researchers have found that certain EMFs reduce the activity of messenger enzymes called protein kinases and also affect the way cell growth is regulated. There is also evidence, now confirmed through research in several countries, that EMFs sometimes work together with cancer-promoting chemicals to increase the risk of cancer beyond that associated with either the chemicals or EMFs alone. EMFs also appear to change the body's rate of production of certain hormones that have cancer-inhibiting effects, such as melatonin. Some studies have found that persons sleeping under electric blankets have lower-than-normal levels of melatonin production when the blanket is operating, but their melatonin production returns to normal when the blanket is switched off. Some scientists think the effect of EMFs on melatonin production may explain many of the apparent health effects of exposure to low-level fields. As with the epidemiological studies, laboratory research has raised questions and stirred controversy. Some laboratory studies have been difficult to replicate: Other researchers have not always observed the same results when they attempted to repeat some experiments. There appear to be other variables that affect the outcome of research on the biological effects of EMFs. For example, there is evidence that low-level EMFs have significant biological effects only at certain frequencies and intensities--and not at other frequencies or intensities. There is a general rule about toxic and cancer-causing chemicals: If some is bad, more is worse. That rule may not necessarily apply to EMFs, however: Some studies have detected biological effects of low-level EMFs--but not when the field is stronger. There are also studies showing health effects at certain frequencies but not at adjacent frequencies. And there are studies suggesting that a radio signal modulated by certain low frequencies, or a signal that is keyed or pulsed, has more harmful effects than an unmodulated, steady carrier. Scientists call these kinds of phenomena window effects, and they greatly complicate any attempt to understand the relationship between EMFs and health. There is an unfortunate footnote to this research on window effects: Much research seems to indicate that there is a window at 50 or 60 Hz--the exact frequency of the electric energy traveling through millions of miles of in-home wiring in the US and many other countries: EMFs at higher and lower frequencies may not have the same health effects as 60-Hz fields. And yet, the financial and technical obstacles that would stand in the way of changing the frequency of ordinary household ac current--should that prove to be desirable--are staggering. After reading this far, if you are uncertain about the possible health effects of EMFs, you're not alone: The scientific community itself does not agree about this issue. In fact, medical doctors, biologists, physicists and other scientific researchers are engaged in an intense, sometimes-emotional debate about the health effects of EMFs. There is a computer bulletin board system for scientists concerned about this issue; messages posted there range from esoteric discussions of these complex issues to personal attacks on some scientists who espouse views not shared by others! If the experts don't always agree, how can the rest of us know what is safe and what isn't? The American National Standards Institute (ANSI), a private body that sets voluntary standards for industry, has had guidelines for exposure to EMFs for many years. In fact, the ANSI guidelines have been revised downward repeatedly to reduce the recommended safe levels of EMF exposure. ANSI adopted its latest guidelines in 1992, but many health scientists have questioned whether even the newest guidelines are adequate to protect public health. Recently, the Environmental Protection Agency publicly questioned the adequacy of the 1992 ANSI standards in an official statement to the Federal Communications Commission. Some scientists challenge the newest ANSI standard on several grounds. For one thing, it's primarily intended to prevent exposure to EMFs strong enough to cause thermal effects, not exposure to weaker EMFs that may cause athermal effects. Nor does the ANSI standard take into account the effects of modulation. And the ANSI standard applies only to RF energy, not to low-frequency EMFs that are so central to public debate these days. There is no generally accepted standard in America for exposure to the low-frequency fields produced by power lines or home appliances. And in general, there is considerable uncertainty about what level of electromagnetic energy should be considered safe. Another problem is that RF fields are difficult to measure. The price of a professional quality RF power density meter runs well into four figures, and low-cost meters for home use are often grossly inaccurate. Even the best meters may not be accurate in the near field, the area close to an antenna where the potential for hazardous RF energy levels is greatest. Field strengths can be calculated using mathematical formulas, but that, too, fails to take into account the random hot spots that often exist in the near field. Fortunately, the low-frequency fields from power lines and appliances are easier to measure than RF power densities. If there is no consensus about safe energy levels, and if EMFs are difficult to measure, what can we do to minimize the potential health hazards of EMFs? Several years ago, Professor M. Granger Morgan of Carnegie Mellon University offered a simple proposal: practice prudent avoidance. Dr Morgan said we should avoid unnecessary exposure to EMFs as a common-sense response to potential--but not yet proven--health hazards. He didn't suggest that we all abandon our electric appliances and go off to live in the woods in cabins without electricity, but he did suggest that we minimize exposure to EMFs when it's practical to do so. He said, in essence, to avoid electromagnetic fields strong enough that they may have adverse health effects. The League has adopted Dr Morgan's approach: The RF safety sections of major ARRL publications urge radio amateurs to practice prudent avoidance wherever possible. Transmitting antennas should be mounted well away from living areas. If medium or high transmitter power (100 watts or more) is to be used, antennas should be mounted on a mast or tower at least 35 feet above any populated area if possible. The FCC/EPA study indicated that with an antenna that high, there is little RF energy where people are. Because feed lines can radiate in some cases, when installing open-wire line (or even coaxial cable if the SWR on the line is high), it's best to route it away from areas where people will be spending a lot of time. When using a ground-mounted or mobile antenna, be careful not to transmit when anyone is near the antenna. A good rule of thumb is to avoid transmitting when anyone is within three feet of a car-mounted 2-meter FM whip if you're using a typical 25-watt transceiver. With a 100-watt amplifier, don't transmit when anyone is within five or six feet of a whip antenna. If you're using a beam antenna and 100 watts or more, follow the 35-foot rule: Don't transmit when anyone is within 35 feet of the front of the antenna (the direction where the antenna is pointed). It may be safe to transmit when people are a little closer to the antenna if everyone is below it or behind it, not in front of it. Exercise particular care when using indoor antennas, including those mounted in attics, because in some situations they can generate substantial RF fields. As much as possible, try to locate indoor antennas as far from people as possible. Use low power (10 watts output or less), and keep your transmissions short when someone might be near the antenna. Never use a power amplifier that has its metal cover removed. The cover provides shielding, keeping the RF energy inside the unit--not out in the room. If you're going to experiment with UHF or microwave equipment, or do moonbounce communications, discuss your installation with experienced operators before getting on the air. UHF and microwave antennas and waveguides--as well as high-gain moonbounce antennas--may produce hazardous levels of RF energy and must be installed carefully so that no person is in the line of fire. Never look into an activated waveguide or stand in front of a high-gain VHF-UHF antenna when the transmitter is on. Be aware that low-frequency fields exist in your home. If possible, avoid being within 24 inches of any electric motor or power transformer while it is turned on. Hair dryers, ac-operated hand drills and other electric devices that are held close to the body when in use often expose users to stronger EMFs than those produced by Amateur Radio equipment. Nevertheless, it is a good idea to stay about 24 inches away from the fans and power transformers found in high-power amplifiers and 12-volt power supplies, for example. The issue of electromagnetic fields and health is as complex as it is controversial. It isn't possible to cover this topic fully in a short article such as this one. A more detailed and technically-oriented treatment of the subject appears in the RF Safety sections of current editions of The ARRL Handbook and The ARRL Antenna Book. The bibliography there lists some of the major scientific works in this field. 1As ARRLWeb reprints this article in 1996, the ARRL Board's RF Safety Committee is the direct descendant of this body. Wayne Overbeck, N6NB, holds PhD and JD degrees and is a Professor of Communications at California State University, Fullerton. He first became interested in this subject because his own operating activities--VHF DXing and contesting with high power portable stations on mountaintops--require special precautions to minimize EMF exposure. In a recent scientific study conducted by a team of researchers from the Technion, a possible link between microwave radiation, similar to the type found in cellular phones, and different kinds of damage to the visual system was found. At least one kind of damage seems to accumulate over time and not heal, challenging the common view and leading the researchers to the assertion that the duration of exposure is not less important than the intensity of the irradiation. The researchers also emphasized that existing exposure guidelines for microwave radiation might have to change. The effects of exposure to electromagnetic radiation have long been a subject for debate among scientists. The technological developments of the last twenty years such as cell and cordless phones, wireless communications, monitors and even high voltage lines have all been studied as potential risk factors for cancer and other diseases. Less known to the public, but still a matter of some extensive research, is the study of the effect of microwave radiation on the visual system and especially on the lens of the eye. The basic motivation for this research came after World War II when it was suspected that radar operators suffered a greater risk of developing cataracts (a condition characterized by clouding in the natural lens of the eye). Although these particular suspicions were eventually shown to be debatable, they were the trigger for the first guidelines for exposure to electromagnetic radiation. Moreover, the eye as our natural radiation detector is the obvious choice for investigating the effects of electromagnetic radiation upon the human body. n more recent studies on animals the effects of microwave radiation as a risk factor for cataracts have been established and have helped determine the guidelines put forth by the International Commission on Non-Ionizing Radiation Protection (ICNIRP) in 1998. A common measure for microwave radiation is the Specific Absorption Rate (SAR) which is the average power density absorbed in a given volume per average weight density (Watt/Kg). This is the standard used by cell phone companies, among others, to measure levels of radiation. When microwave energy impinges upon body tissue, part of it is absorbed and converted to heat due to ionic conduction. This heat manifests itself as a temperature increase inside the tissue. Past studies in animals have shown that even a slight increase in temperature close to the lens (as low as 3 degrees Celsius) can increase the risk of developing a cataract. With a low enough SAR the local temperature in the lens might never increase to that level. A less common measure is called Specific Energy Absorption (SA), and is defined as the energy density absorbed in the tissue divided by its weight density. While SAR is the measure of the rate microwave radiation is absorbed by a tissue, SA is the measure of the total energy absorbed. This difference played a significant role in a recently published study on the effects of microwave radiation on the visual system. In the study conducted by researchers in the Rappaport Faculty of Medicine at the Technion, and published in the journal Bioelectromagnetics, a new link has been found between microwave radiation and the development of cataracts. Eye lenses of one-year-old male calves obtained from a slaughterhouse were exposed to microwave radiation - one eye from each pair used for control. Each exposure session lasted about two weeks. Both control and exposed lens were kept in an incubator at a constant temperature. During this period each exposed lens had experienced up to 2mW of 1.1GHz radiation virtually around the clock, and each hour it was exposed for a 50 minute session followed by a 10 minute break. During one of these breaks, every 24 hours, it was tested optically and compared to the control lens. During the short (5 minutes) optical test, the lens was not exposed to radiation, but when exposed, its average temperature was maintained constant in an incubator. 1. Exposing the lens for a prolonged time to microwave radiation (in the frequency and intensity described above) caused macroscopic damage affecting the optical quality of the lens. This damage increased as the experiment and irradiation continued and reached a maximum level after a number of days. When the exposure stopped the optical damage began to heal gradually. Interestingly enough, a similar maximum level was observed when the irradiation intensity was reduced to one-half the original, except that it took twice the time. 2. On the microscopic level a different kind of damage occurred. Tiny "bubbles" were created on the surface of the lens. The bubbles were formed by irradiation with microwave and were not the result of a heat created throughout the lens. The researchers have speculated that the mechanism responsible for the creation of the bubbles is microscopic friction between particular cells exposed to electromagnetic radiation. Contrary to the macroscopic damage, the microscopic damage did not show any signs of healing and continued to accumulate during the course of the experiment. Although the researchers are cautious about interpreting the results of the experiment and its possible implications to public health, it seems that prolonged exposure to microwave radiation similar to that used by cellular phones can lead to both macroscopic and microscopic damage to the lens and that at least part of this damage seems to accumulate over time and does not seem to heal. Professor Levi Schächter, who worked on the research, told IsraCast that attention should be paid not only to the Specific Absorption Rate (SAR) but also to the total energy absorbed by the tissue (SA), which is not currently under supervision by the appropriate regulative authorities. Implying that the duration of exposure is not less important than the intensity of the irradiation. Source: http://www.isracast.com/tech_news/250705_tech.htm and has pictures and charts. A single 2-hour exposure to the microwaves emitted by some cell phones kills brain cells in rats, a group of Swedish researchers claims. If confirmed, the results would be the first to directly link cell-phone radiation to brain damage in any animal. No such evidence exists for people. But with cell-phone use skyrocketing, some scientists recommend precautionary measures—for example, avoiding excessive gabbing on the phones. Digital cell phones send out compressed information through microwave pulses of electromagnetic radiation. In the United States, standard phones emit 50 such pulses per second, while so-called GSM phones—which operate under the international standard called Global System for Mobile Communications—emit 217. Those pulses scatter low-level microwave radiation across the brain. To date, convincing evidence linking the phones to serious health problems, such as cancer, is lacking, says Leif G. Salford of Lund University Hospital in Sweden. Even so, he and his colleagues are still looking for such connections. About 10 years ago, they showed that cell-phone radiation causes the protective barrier in rats' brains to leak, permitting blood proteins that are normally kept away from brain tissue to contact neurons. Adolescent rats were exposed for 2 hours to GSM phones at one of three power levels: 0.01, 0.1, or 1 watt (W). Rats in a control group were not exposed. Cell phones typically operate at a peak output power of 0.6 W.
Examination of the animals' brain tissue 50 days later revealed that up to 2 percent of the brain cells of rats that had received cell-phone radiation exposures of 0.1 watt or greater were dead or dying. The hippocampus, cortex, and brain stem suffered the most damage. The other groups showed no significant brain-cell death. Salford cautions that the results may not apply to real-world cell-phone use. On the other hand, he notes, "there might be negative consequences in the long run." Previous studies have shown a variety of biological effects of cell phone-type radiation, but no convincing evidence of health damage (SN: 6/29/02, p. 404: http://sciencenews.org/20020629/fob3.asp; 5/20/00, p.326: Available to subscribers at http://sciencenews.org/20000520/fob5.asp; 2/12/00, p. 100: http://www.sciencenews.org/20000212/fob1.asp). Henry C. Lai of the University of Washington in Seattle finds Salford's new results "quite intriguing." He says, "The energy absorbed by the rats was really low compared to what a person gets when using a cell phone." Particularly if the effects add up over time, Lai says, regular use of cell phones could be problematic. And it's not just the phones. In the modern, wireless office, people are increasingly exposed to a "sea of microwaves," says neuroscientist W. Ross Adey of Loma Linda University in California. "You have to ask, How much can people handle before it becomes a significant problem?" he says. For the record, Salford himself does use a cell phone. To limit his exposure, however, he cuts calls short and distances himself from the phone with a hands-free headset. In reference to the hands-free headsets mentioned in your article, it has been shown that on the wire to a cell phone, a standing wave can exist that can penetrate deep into the brain. Source: http://www.sciencenews.org/articles/20030222/fob1.asp and contains links. Brain cancer and mobile phones - new French study begins to look at 6,000 mobile phone users in 14 countries, 50% of whom have brain cancer. Dr Elizabeth Cardis of the International Centre for Cancer Research in Lyon will report in 2003. A spate of brain tumours among staff has forced Melbourne's RMIT University to close part of its business school and test for radiation emissions from rooftop phone towers. As staff reacted with shock, the university yesterday shut the top two floors of the Bourke Street building and ordered more than 100 employees to work from home for the next fortnight. The closure follows the discovery of five brain tumours in the past month and two others in 1999 and 2001. Two were malignant and five were benign. WorkCover has launched an investigation and RMIT has promised its own inquiry. The academics' union last night expressed concern that the tumours were caused by the communications towers on the roof of the former Tivoli Theatre site. National Tertiary Education Union state secretary Matthew McGowan warned that anecdotal reports from hastily arranged staff meetings yesterday suggested the number of people affected would grow. "You have to ask some pretty serious questions and we're obviously concerned that it could be linked to the tower," he said. "This would appear to be much more than coincidence and RMIT has a responsibility to leave no stone unturned in seeking the truth." Five of the seven affected work on the top floor of the 17-storey building. All except one have worked in the building for at least a decade. An RMIT academic who did not want to be named said staff - the 16th and 17th floors are home to offices of senior management and lecturers - were "in disbelief, concerned and upset" as they attended meetings and left the building late yesterday. Medical experts said no definitive link had been proved between mobile phone tower radiation and cancer. Australian Medical Association president Mukesh Haikerwal said there was no proof of a connection but "if you get clusters of disease it's sensible to investigate." Dr John Gall, from private health company Southern Medical Services, which has been called in to assess the sick, said last night three of those affected had tumours showing symptoms consistent with radiation. But he said there was no causal link with the building based on preliminary observations. A spokesman for state Health Minister Bronwyn Pike said WorkCover would investigate the matter and the Department of Human Services would provide any expertise needed. RMIT chief operating officer Steve Somogyi said testing was carried out on the building after the first two of the seven tumours were reported in 1999 and 2001. It found radiation and air quality levels within recommended guidelines. "We value the health and safety of our staff and students very highly. The incidence of illness is disturbing and we shall continue to check for any possible cause connected to the building," Mr Somogyi said. But RMIT union branch president Jeanette Pierce said the university agreed to shut the two floors only after being pressured by the union. "I'm a bit mystified that the university wasn't planning to vacate and that we had to make the point that they needed to vacate those two floors," she said. There are more than 160 mobile phone towers in central Melbourne alone. A Telstra spokeswoman said last night the company had two towers at the Tivoli site, but both met health and safety standards and were tested regularly. "An enormous amount of medical research has been conducted without any substantiated evidence of a link between mobile phone technology and adverse health effects, including cancer," she said. RMIT management emailed all staff and students late yesterday and said health check-ups and counselling would be made available. About 600 staff work in the building. Mr McGowan said shutting the two floors should be just the first step. "We think they should be testing all staff who have worked on those levels and not just for tumours. We need to understand what are the health risks that people are suffering," he said. A help line for students and family members is available on 1800 155 945. Tanya Stoianoff, the executive director of the Mobile Carriers Forum, which represents mobile phone companies, said there was no credible scientific evidence of health effects from living or working near a mobile phone base station. Wired News Report 09:30 AM Jun, 26, 2006. Thanks to Rick Davis for the 'heads up'. Cell phone emissions excite the part of the brain cortex nearest to the phone, but it is not clear if these effects are harmful, Italian researchers reported on Monday. Their study, published in the Annals of Neurology , adds to a growing body of research about mobile phones, their possible effects on the brain and whether there is any link to cancer. About 730 million cell phones are expected to be sold this year, according to industry estimates, and nearly 2 billion people around the world already use them. Of these, more than 500 million use a type that emits electromagnetic fields known as Global System for Mobile communications or GSM radio phones. Their possible effects on the brain are controversial and not well understood. Dr. Paolo Rossini of Fatebenefratelli hospital in Milan and colleagues used Transcranial Magnetic Stimulation or TMS to check brain function while people used these phones.They had 15 young male volunteers use a GSM 900 cell phone for 45 minutes. In 12 of the 15, the cells in the motor cortex adjacent to the cell phone showed excitability during phone use but returned to normal within an hour. The cortex is the outside layer of the brain and the motor cortex is known as the "excitable area" because magnetic stimulation has been shown to cause a muscle twitch. The researchers stressed that they had not shown that using a cell phone is bad for the brain in any way, but people with conditions such as epilepsy, linked with brain cell excitability, could potentially be affected. Men who are heavy users of mobile phones have significantly lower sperm counts than usual, according to new research that suggests radiation from handsets could be damaging male fertility. Both the quantity and quality of a man's sperm declines as his daily mobile use increases, a study of 361 infertility patients in the United States has found. The greatest effects were seen among very heavy users who talk on a mobile for more than four hours a day, these produce about 40 per cent less sperm than men who never use a mobile at all. Smaller falls in sperm count were also seen among those who use mobiles less frequently. The findings, from a team led by Ashok Agarwal of the Cleveland Clinic in Ohio, could indicate that the electromagnetic fields generated by mobile phone handsets are interfering with sperm production. Previous studies have shown that close and heavy exposure to this form of radiation damages sperm in the laboratory, though an effect has never been convincingly demonstrated in the real people. Other researchers cautioned that the study shows only an association between mobile phone use and sperm counts and not a causal link. It is more likely that heavy use is a proxy for another factor, such as stress or obesity, that is actually responsible for the effect, they said. "On the face of it, the findings seem pretty robust, but I can only assume that mobile phone use is some kind of surrogate for something else," said Allan Pacey, a senior lecturer in andrology at the University of Sheffield. "If you are holding it up to your head to speak a lot, it makes no sense it is having a direct effect on your testes. "Maybe people who use a phone for four hours a day spend more time sitting in cars, which could mean there's a heat issue. It could be they are more stressed, or more sedentary and sit about eating junk food getting fat. Those seem to be better explanations than a phone causing the damage at such a great distance." Dr Agarwal, who presented the results today at the American Society for Reproductive Medicine conference in New Orleans, said they were worrying because of the huge extent of mobile phone use. "Almost a billion people are using cell phones around the world and the number is growing in many countries at 20 to 30 per cent a year," he said. "In another five years the number is going to double. "People use mobile phones without thinking twice what the consequences may be. It is just like using a toothbrush but mobiles could be having a devastating effect on fertility. It still has to be proved but it could have a huge impact because mobiles are so much part of our lives." In the study, 361 men who were having their sperm analysed prior to fertility treatment were asked about their mobile use and split into four groups: those who never used a phone and those who used one for less than two hours, two to four hours, and more than four hours a day. Median sperm counts were measured at 85.89 million per millilitre for non-users, 69.03 for the second group, 58.87 for the third and 50.30 for the fourth. Sperm motility, or swimming ability, also fell with increasing phone use, as did other measures of quality. "The main finding was that on all four parameters - sperm count, motility, viability and morphology - there were significant differences between the groups," Dr Agarwal said. "The greater the use of cell phones the greater the decrease in these four parameters. That was very clear and very significant." The results are similar to those of a previous study from the University of Szeged in Hungary, which found a 30 per cent reduction in sperm count among men who kept a mobile on standby in their trouser pockets. That research also failed to control for lifestyle. Such controls are important because sperm production is very sensitive to a number of factors, including obesity and heat: lorry drivers and travelling salesmen, for example, tend to have low sperm counts because the long hours they spend sitting warms their testes. Dr Agarwal said that if the effect is genuinely caused by mobiles, several explanations are possible. Animal work has shown that electromagnetic fields can damage Leydig cells in the testes and mobiles are also known to cause a heating effect on tissue that might be hazardous to sperm. Both phenomena occur over short distances, so holding a phone at a distance from the crotch while speaking should not be dangerous. A cell phone in the front pocket of a Vallejo man's pants spontaneously combusted, quickly ignited his clothes and left the man with second- and third-degree burns across at least half his body, according to investigators. Luis Picaso, 59, was apparently sleeping on a white, all-plastic lawn chair in his room late Saturday night and was awakened as he was ablaze, said Vallejo Fire Department investigator and spokesman Bill Tweedy. By the time authorities arrived shortly before midnight, Picaso was on the floor of the bathroom. He was in stable condition Sunday, Tweedy said Monday night. The plastic lawn chair -- a petroleum product causing a high-heat fire -- had melted. Picaso's soccer jersey -- made of quick-burning nylon -- was almost completely burned away. "I did find one scrap on the floor," said Tweedy. "Cotton holds up the best," said Tweedy. "The only thing he had on that was cotton was his underwear. Everywhere the nylon was, that's where he got burns." Tweedy said that from the burn patterns on Picaso's clothes and body, it was clear the fire began in the right front pocket of his polyester-blend slacks. "There were no matches," Tweedy said. "There were no lighters. He wasn't smoking. The only source was the phone that was in his pocket. I know he didn't spontaneously combust." Tweedy declined to name the manufacturer or model of the phone. "I don't believe it's a problem with any particular cell phone maker," said Tweedy. "It's a piece of electrical equipment. All electrical equipment can have a malfunction. This is a freak accident. ... It could be any brand of phone that could do that." Federal authorities have reported very rare instances of cell phones catching on fire. Between roughly 2002 and 2004, the federal Consumer Product Safety Commission received 83 reports of cell phones catching on fire. In 2004, there were an estimated 170 million cell phone users in the United States. Today, there are 219 million. E-mail Matthai Chakko Kuruvila at mkuruvila@sfchronicle.com. LYON, France, Jan. 25 (UPI) -- A European study suggests people using cell phones for 10 or more years have a higher risk of developing brain tumors than do non-cell phone users. The five-nation study involving more than 4,500 people found a statistically significant increase in the incidence of tumors on the side of the head where the users hold their cell phones, the South Florida Sun-Sentinel reported. "Although our results overall do not indicate an increased risk of glioma in relation to mobile phone use, the possible risk in the most heavily exposed part of the brain with long-term use needs to be explored further before firm conclusions can be drawn," the researchers said. The study covering the United Kingdom, Sweden, Denmark, Norway and Finland is to be published next month in the International Journal of Cancer. Colony Collapse Disorder (CCD) occurs when a hive's inhabitants suddenly disappear, leaving only queens, eggs and a few immature workers, like so many apian Mary Celestes. The vanished bees are never found, but thought to die singly far from home. The parasites, wildlife and other bees that normally raid the honey and pollen left behind when a colony dies, refuse to go anywhere near the abandoned hives. The alarm was first sounded last autumn, but has now hit half of all American states. The West Coast is thought to have lost 60 per cent of its commercial bee population, with 70 per cent missing on the East Coast. CCD has since spread to Germany, Switzerland, Spain, Portugal, Italy and Greece. And last week John Chapple, one of London's biggest bee-keepers, announced that 23 of his 40 hives have been abruptly abandoned. Other apiarists have recorded losses in Scotland, Wales and north-west England, but the Department of the Environment, Food and Rural Affairs insisted: "There is absolutely no evidence of CCD in the UK." The implications of the spread are alarming. Most of the world's crops depend on pollination by bees. Albert Einstein once said that if the bees disappeared, "man would have only four years of life left". No one knows why it is happening. Theories involving mites, pesticides, global warming and GM crops have been proposed, but all have drawbacks. German research has long shown that bees' behaviour changes near power lines. Now a limited study at Landau University has found that bees refuse to return to their hives when mobile phones are placed nearby. Dr Jochen Kuhn, who carried it out, said this could provide a "hint" to a possible cause. Dr George Carlo, who headed a massive study by the US government and mobile phone industry of hazards from mobiles in the Nineties, said: "I am convinced the possibility is real." Evidence of dangers to people from mobile phones is increasing. But proof is still lacking, largely because many of the biggest perils, such as cancer, take decades to show up. Most research on cancer has so far proved inconclusive. But an official Finnish study found that people who used the phones for more than 10 years were 40 per cent more likely to get a brain tumour on the same side as they held the handset. Equally alarming, blue-chip Swedish research revealed that radiation from mobile phones killed off brain cells, suggesting that today's teenagers could go senile in the prime of their lives. Studies in India and the US have raised the possibility that men who use mobile phones heavily have reduced sperm counts. And, more prosaically, doctors have identified the condition of "text thumb", a form of RSI from constant texting. Professor Sir William Stewart, who has headed two official inquiries, warned that children under eight should not use mobiles and made a series of safety recommendations, largely ignored by ministers. Are Your Cell Phone and Laptop Bad for Your Health? By Stan Cox, AlterNet. Posted July 31, 2007. For years, opponents of cell towers and wireless technology have voiced concerns about potential health effects of electromagnetic fields. Once ridiculed as crackpots and Luddites, they're starting to get backup from the scientific community. In the wee hours of July 14, a 45-year-old Australian named John Patterson climbed into a tank and drove it through the streets of Sydney, knocking down six cell-phone towers and an electrical substation along the way. Patterson, a former telecommunications worker, reportedly had mapped out the locations of the towers, which he claimed were harming his health. In recent years, protesters in England and Northern Ireland have brought down cell towers by sawing, removing bolts, and pulling with tow trucks and ropes. In one such case, locals bought the structure and sold off pieces of it as souvenirs to help with funding of future protests. In attempts to fend off objections to towers in Germany, some churches have taken to disguising them as giant crucifixes. Opposition to towers usually finds more socially acceptable outlets, and protests are being heard more often than ever in meetings of city councils, planning commissions, and other government bodies. This summer alone, citizen efforts to block cell towers have sprouted in, among a host of other places, including California, New Jersey, Maryland, Illinois, North Dakota and north of the border in Ontario and British Columbia. Transmitters are already banned from the roofs of schools in many districts. For years, towers have been even less welcome in the United Kingdom, where this summer has seen disputes across the country. Most opponents cite not only aesthetics but also concerns over potential health effects of electromagnetic (EM) fields generated by the towers. Once ridiculed as crackpots and Luddites, they're starting to get backup from the scientific community. It's not just cell phones they're worried about. The Tottenham area of London is considering the suspension of all wireless technology in its schools. Last year, Fred Gilbert, a respected scientist and president of Lakehead University in Ontario, banned wireless internet on his campus. And resident groups in San Francisco are currently battling Earthlink and Google over a proposed city-wide Wi-Fi system. For decades, concerns have been raised about the health effects of "extremely low frequency" fields that are produced by electrical equipment or power lines. People living close to large power lines or working next to heavy electrical equipment are spending a lot of time in electromagnetic fields generated by those sources. Others of us can be exposed briefly to very strong fields each day. But in the past decade, suspicion has spread to cell phones and other wireless technologies, which operate at frequencies that are millions to tens of millions higher but at low power and "pulsed." Then there's your cell phone, laptop, or other wireless device, which not only receives but also sends pulsed signals at high frequencies. Because it's usually very close to your head (or lap) when in use, the fields experienced by your body are stronger than those from a cell tower down the street. A growing number of scientists, along with a diverse collection of technology critics, are pointing out that our bodies constantly generate electrical pulses as part of their normal functioning. They maintain that incoming radiation from modern technology may be fouling those signals. But with hundreds of billions in sales at stake, the communications industry (and more than a few scientists) insist that radio-frequency radiation can't have biological effects unless it's intense enough to heat your flesh or organs, in the way a microwave oven cooks meat. It's also turning out that when scientific studies are funded by industry, the results a lot less likely to show that EM fields are a health hazard. Low frequency, more frequent disease? Before the digital revolution, a long line of epidemiological studies compared people who were exposed to strong low-frequency fields -- people living in the shadow of power lines, for example, or long-time military radar operators -- to similar but unexposed groups. One solid outcome of that research was to show that rates of childhood leukemia are associated with low-frequency EM exposure; as a result, the International Agency for Research on Cancer has labeled that type of energy as a possible carcinogen, just as they might label a chemical compound. Other studies have found increased incidence of amyotrophic lateral sclerosis (commonly called ALS or Lou Gehrig's disease), higher rates of breast cancer among both men and women, and immune-system dysfunction in occupations with high exposure. Five years ago, the California Public Utilities Commission asked three epidemiologists in the state Department of Health Services to review and evaluate the scientific literature on health effects of low-frequency EM fields. The epidemiologists, who had expertise in physics, medicine, and genetics, agreed in their report that they were "inclined to believe that EMFs can cause some degree of increased risk of childhood leukemia, adult brain cancer, Lou Gehrig's disease, and miscarriage" and were open to the possibility that they raise the risks of adult leukemia and suicide. They did not see associations with other cancer types, heart disease, or Alzheimer's disease. Epidemiological and animal studies have not been unanimous in finding negative health effects from low-frequency EM fields, so the electric-utility industry continues to emphasize that no cause-and-effect link has been proven. Now the most intense debate is focused on radio-frequency fields. As soon as cell phones came into common usage, there was widespread concern that holding an electronic device against the side of your head many hours a month for the rest of your life might be harmful, and researchers went to work looking for links to health problems, often zeroing in on the possibility of brain tumors. Until recently, cell phones had not been widely used over enough years to evaluate effects on cancers that take a long time to develop. A number of researchers failed to find an effect during those years, but now that the phones have been widely available for more than a decade, some studies are relating brain-tumor rates to long-term phone use. Some lab studies have found short-term harm as well. Treatment with cell-phone frequencies has disrupted thyroid-gland functioning in lab rats, for example. And at Lund University in Sweden, rats were exposed to cell-phone EM fields of varying strengths for two hours; 50 days later, exposed rats showed significant brain damage relative to non-exposed controls. The authors were blunt in their assessment: "We chose 12-26-week-old rats because they are comparable with human teenagers -- notably frequent users of mobile phones -- with respect to age. The situation of the growing brain might deserve special concern from society because biologic and maturational processes are particularly vulnerable during the growth process." Even more recently, health concerns have been raised about the antenna masts that serve cell phones and other wireless devices. EM fields at, say, a couple of blocks from a tower are not as strong as those from a wireless device held close to the body; nevertheless many city-dwellers are now continuously bathed in emissions that will only grow in their coverage and intensity. Last year, the RMIT University in Melbourne, Australia closed off the top two floors of its 17-story business school for a time because five employees working on its upper floors had been diagnosed with brain tumors in a single month, and seven since 1999. Cell phone towers had been placed on the building's roof a decade earlier and, although there was no proven link between them and the tumors, university officials were taking no chances. Data on the health effects of cell or W-Fi towers are still sparse and inconsistent. Their opponents point to statistically rigorous studies like one in Austria finding that headaches and difficulty with concentration were more common among people exposed to stronger fields from cell towers. All sides seem to agree on the need for more research with solid data and robust statistical design. San Francisco, one of the world's most technology-happy cities, is home to more than 2400 cell-phone antennas, and many of those transmitters are due to be replaced with more powerful models that can better handle text messaging and photographs, and possibly a new generation of even higher-frequency phones. Now there's hot-and-heavy debate over plans to add 2200 more towers for a city-wide Earthlink/Google Wi-Fi network. On July 31, the city's Board of Supervisors considered an appeal by the San Francisco Neighborhood Antenna-Free Union (SNAFU) that the network proposal be put through an environmental review -- a step that up to now has not been required for such telecommunications projects. In support of the appeal, Magda Havas, professor of environmental and resource studies at Trent University in Ontario submitted an analysis of radio-frequency effects found in more than 50 human, animal, and cellular-level studies published in scientific journals. Havas has specialized in investigating the effects of both low- and high-frequency EM radiation. She says most of the research in the field is properly done, but that alone won't guarantee that all studies will give similar results. "Natural variability in biological populations is the norm," she said. And, she says, informative research takes time and focus: "For example, studies that consider all kinds of brain tumors in people who've only used cell phones for, say, five years don't show an association. But those studies that consider only tumors on the same side of the head where the phone is held and include only people who've used a phone for ten years or more give the same answer very consistently: there's an increased risk of tumors." In other research, wireless frequencies have been associated with higher rates of miscarriage, testicular cancer, and low sperm counts. Direct current from a battery can be used to encourage healing of broken bones. EM fields of various frequencies have also been shown to reduce tissue damage from heart attacks, help heal wounds, reduce pain, improve sleep, and relieve depression and anxiety. If they are biologically active enough to promote health, are they also active enough to degrade it? At the 2006 meeting of the International Commission for Electromagnetic Safety in Benevento, Italy, 42 scientists from 16 countries signed a resolution arguing for much stricter regulation of EM fields from wireless communication. Four years earlier, in Freiburger, Germany, a group of physicians had signed a statement also calling for tighter regulation of wireless communication and a prohibition on use of wireless devices by children. In the years since, more than 3000 doctors have signed the so-called "Freiburger Appeal" and documents modeled on it. But in this country, industry has pushed for and gotten exemption from strict regulation, most notably through the Telecommunications Act of 1996. Libby Kelley, director of the Council on Wireless Technology Impacts in Novato, California says, "The technology always comes first, the scientific and environmental questions later. EM trails chemicals by about 10 years, but I hope we'll catch up." Kelley says a major problem is that the Telecommunications Act does not permit state or local governments to block the siting of towers based on health concerns: "We'll go to hearings and try to bring up health issues, and officials will tell us, 'We can't talk about that. We could get sued in federal court!'" Industry officials are correct when they say the scientific literature contains many studies that did not find power lines or telecommunication devices to have significant health effects. But when, as often happens, a range of studies give some positive and some negative results, industry people usually make statements like, "Technology A has not been proven to cause disease B." Michael Kundi, professor at the Medical University of Vienna, Austria and an EM researcher, has issued a warning about distortions of the concept of cause-and-effect, particularly when a scientific study concludes that "there is no evidence for a causal relationship" between environmental factors and human health. Noting that science is rarely able to prove that A did or did not "cause" B, he wrote that such statements can be "readily misused by interested parties to claim that exposure is not associated with adverse health effects." Scientists and groups concerned about current standards for EM fields have criticized the World Health Organization (WHO) and other for downplaying the risks. And some emphasize the risk of financial influence when such intense interest is being shown by huge utilities and a global communications industry that's expected to sell $250 billion worth of wireless handsets per year by 2011 (that's just for the instruments, not counting monthly bills). Microwave News cited Belgian reports in late 2006 that two industry groups -- the GSM Association and Mobile Manufacturers Forum -- accounted for more than 40 percent of the budget for WHO's EM fields project in 2005-06. When a US National Academy of Sciences committee was formed earlier this year to look into health effects of wireless communication devices, the Center for Science in the Public Interest and Sage Associates wrote a letter to the Academy charging that the appointment of two of the committee's six members was improper under federal conflict-of-interest laws. One of the committee members, Leeka Kheifets, a professor of epidemiology in UCLA's School of Public Health, has, says the letter, "spent the majority of the past 20 years working in various capacities with the Electric Power Research Institute, the research arm of the electric power industry." The other, Bernard Veyret, senior scientist at the University of Bordeaux in France, "is on the consulting board of Bouygues Telecom (one of 3 French mobile phone providers), has contracts with Alcatel and other providers, and has received research funding from Electricite de France, the operator of the French electricity grid." The NAS committee will be holding a workshop this month and will issue a report sometime after that. A paper published in January in the journal Environmental Health Perspectives found that when studies of cell phone use and health problems were funded by industry, they were much less likely to find a statistically significant relationship than were publicly funded studies. The authors categorized the titles of the papers they surveyed as either negative (as in "Cellular phones have no effect on sleep patterns"), or neutral (e.g., "Sleep patterns of adolescents using cellular phones"), or positive, (e.g., "Cellular phones disrupt sleep"). Fully 42 percent of the privately funded studies had negative titles and none had positive ones. In public or nonprofit studies, titles were 18 percent negative and 46 percent positive. Alluding to previous studies in the pharmaceutical and tobacco industries, the authors concluded, "Our findings add to the existing evidence that single-source sponsorship is associated with outcomes that favor the sponsors' products." By email, I asked Dr. John Moulder, a senior editor of the journal Radiation Research, for his reaction to the study. Moulder, who is Professor and Director of Radiation Biology in the Department of Radiation Oncology at the University of Wisconsin, did not think the analysis was adequate to conclusively demonstrate industry influence and told me that in his capacity as an editor, "I have not noted such an effect, but I have not systematically looked for one either. I am certainly aware that an industry bias exists in other areas of medicine, such as reporting of clinical trails." Moulder was lead author on a 2005 paper concluding that the scientific literature to that point showed "a lack of convincing evidence for a causal association between cancer and exposure to the RF [radio-frequency] energy used for mobile telecommunications." The Center for Science in the Public Interest has questioned Moulder's objectivity because he has served as a consultant to electric-power and telecommunications firms and groups. Moulder told me, "I have not done any consulting for the electric power and telecommunications industry in years, and when I was doing consulting for these industries, the journals for which I served as an editor or reviewer were made aware of it." A year ago, Microwave News also reported that approximately one-half of all studies looking into possible damage to DNA by communication-frequency EM fields found no effect. But three-fourths of those negative studies were industry- or military-funded; indeed, only 3 of 35 industry or military papers found an effect, whereas 32 of 37 publicly funded studies found effects. Magda Havas sees a shortage of public money in the US for research on EM health effects as one of the chief factors leading to lack of a rigorous public policy, telling me, "Much of the research here ends up being funded directly or indirectly by industry. That affects both the design and the interpretation of studies." As for research done directly by company scientists, "It's the same as in any industry. They can decide what information to make public. They are free to downplay harmful effects and release information that's beneficial to their product." Meanwhile, at Trent University where Havas works, students using laptops are exposed to radio-frequency levels that exceed international guidelines. Of that, she says, "For people who've been fully informed and decide to take the risk, that's their choice. But what about those who have no choice, who have a cell-phone tower outside their bedroom window? "It's the equivalent of secondhand smoke. We took a long time to get the political will to establish smoke-free environments, and we now know we should have done it sooner. How long will it take to react to secondhand radiation?" For more information, visit Environmnental Health Perspectives; Microwave News; the National Center for Biotechnology Information. Britain's biggest-ever study into mobile phone safety has warned that a long-term cancer risk cannot be ruled out. Scientists say possible dangers to children are also unknown - despite the millions of pounds spent during six years of research. As a result, investigators say they cannot update "precautionary" advice issued in 2005. That warned parents to limit children's use of mobiles and said those under eight should not use them at all. The results from the Mobile Telecommunications and Health Research programme show no shortterm harm to brain and cells among adults from mobile phone signals or base stations, or from signals used by the emergency services. But the scientists found a "very slight hint" of increased cases of some type of brain tumours among people who had been using mobiles for more than 10 years. The data was "at the borderline of statistical significance" but should be investigated further, they said. Little research was commissioned on children, largely because the programme prioritised adult research for ethical reasons and on the basis that it would produce information relevant to the youngsters. The researchers called the results "reassuring", but stressed that further studies would be needed for the foreseeable future as mobile phone use continues to grow. MTHR chairman Professor Lawrie Challis admitted that only a small proportion of the research had included adults using mobile phones for longer than a decade, usually the time needed for cancer symptoms to appear. He said: "We cannot rule out the possibility at this stage that cancer could appear in a few years' time. "There is no way we can do that, both because the epidemiological evidence we have is not strong enough to rule it out and because most cancers cannot be detected until 10 years after whatever caused them. "With smoking there was no link of any lung cancer until after 10 years." Professor Challis said two other studies had failed to find any adverse effects of mobile use on children. But he accepted they reacted differently from adults to a number of other environmental agents such as lead and ionising radiation. Further research in the pipeline would look specifically at children. In the meantime, there was nothing in the report that would change advice to parents about minimising their children's use of mobile phones, he said. The MTHR programme was set up in 2001, with joint funding from Government and industry totalling £8.8million. Professor Challis stressed that it was run by independent experts so the "public can believe the results". There are now 70 million mobile phone handsets in the UK, and around 50,000 masts. Both emit radio signals and electromagnetic fields that can penetrate the brain, and campaigners fear this could seriously damage health. Roger Coghill, of Coghill Research Laboratories in South Wales, which specialises in the effects of electromagnetic radiation, said the new report made "selective" choices for research which ignored growing evidence about brain effects. He said "Normal use of a mobile phone for a couple of minutes may not cause any health effects, but what about calls of 20 minutes? Tradesman are among those making heavy use of their phones. "There are many omissions in this report, not least important work on children, and there are biological reasons why we should have concerns about children and old people." Yasmin Skelt, of the campaigning group Mast Sanity, which campaigns against base stations, said: "Mast Sanity believes that pulsed microwave radiation at current exposure levels represents a risk to health and that the MTHR programme doesn't go far enough and has ignored many independent studies showing the risk. "They have only reviewed their own small sample of studies and ignored the thousands of existing studies showing a risk." Using a mobile phone for more than 10 years increases the risk of getting brain cancer, according to the most comprehensive study of the risks yet published. The study -- which contradicts official pronouncements that there is no danger of getting the disease -- found that people who have had the phones for a decade or more are twice as likely to get a malignant tumour on the side of the brain where they hold the handset. The scientists who conducted the research say using a mobile for just an hour every working day during that period is enough to increase the risk -- and that the international standard used to protect users from the radiation emitted is "not safe" and "needs to be revised". They conclude that "caution is needed in the use of mobile phones" and believe children, who are especially vulnerable, should be discouraged from using them at all. The study, published in the latest issue of the peer-reviewed journal Occupational Environmental Medicine, is important because it pulls together research on people who have used the phones for long enough to contract the disease. Cancers take at least 10 years -- and normally much longer -- to develop but, as mobile phones have spread so recently and rapidly, relatively few people have been using them that long. Official assurances that the phones are safe have been based on research that has, at best, included only a few people who have been exposed to the radiation for long enough to get the disease, and are therefore of little or no value in assessing the real risk. Last month, Britain's largest investigation into the health risks of the technology, the £8.8m Mobile Telecommunications and Health Research (MTHR) programme -- funded by "government and industry sources" -- reported that "mobile phones have not been found to be associated with any biological or adverse health effects". But its chairman, Professor Lawrie Challis, admitted that only a small proportion of the research had covered people who had used the phones for more than a decade. He warned: "We cannot rule out the possibility at this stage that cancer could appear in a few years' time." He said the investigation had discovered "a very slight hint" of increased numbers of brain tumours among those exposed for more than 10 years, and called for more research. The new study -- headed by two Swedes, Professor Lennart Hardell of the University Hospital in Orebro and Professor Kjell Hansson Mild of Umea University, who also serves on the MTHR programme's management committee -- goes some way to meeting the deficiency. The scientists pulled together the results of the 11 studies that have so far investigated the occurrence of tumours in people who have used phones for more than a decade, drawing on research in Sweden, Denmark Finland, Japan, Germany, the United States and Britain. They found almost all had discovered an increased risk, especially on the side of the head where people listened to their handsets. Five of the six studies of malignant gliomas, cancers of the glial cells that support and protect the nerve cells, found an increased risk. The only one that did not still found an increase in benign gliomas. Four of the five studies that looked at acoustic neuromas -- benign but often disabling tumours on the auditory nerve, which usually cause deafness -- found them. The exception was based on only two cases of the disease, but still found that long-term users had larger tumours than other people. The scientists assembled the findings of all the studies to analyse them collectively. This revealed that people who have used their phones for a decade or more are 20 per cent more likely to contract acoustic neuromas, and 30 per cent more likely to get malignant gliomas. The risk is even greater on the side of the head the handset is used: long-term users were twice as likely to get the gliomas, and two and a half times more likely to get the acoustic neuromas there than other people. The scientists conclude: "Results from present studies on use of mobile phones for more than 10 years give a consistent pattern of an increased risk for acoustic neuroma and glioma." They add that "an increased risk for other types of brain tumours cannot be ruled out". Professors Hardell and Mild have also themselves carried out some of the most extensive original work into tumours among long-term mobile phone users and have come up with even more alarming results. Their research suggests they are more than three times more likely to get malignant gliomas than other people, and nearly five times more likely to get them on the side of the head where they held the phone. For acoustic neuromas they found a threefold and three-and-a-half-fold increased risk respectively. They have also carried out the only study into the effects of the long-term use of cordless phones, and found this also increased both kinds of tumours. Their research suggests that using a mobile or cordless phone for just 2,000 hours -- less than an hour every working day for 10 years -- is enough to augment the risk. Professor Mild told The Independent on Sunday: "I find it quite strange to see so many official presentations saying that there is no risk. There are strong indications that something happens after 10 years." He stressed that brain cancers are rare: they account for less than 2 per cent of primary tumours in Britain, though they are disproportionately deadly, causing 7 per cent of the years of life lost to the disease. "Every cancer is one too many," he said. He said he uses a mobile phone as little as possible, and urges others to use hands-free equipment and make only short calls, reserving longer ones for landlines. He also said that mobiles should not be given to children, whose thinner skulls and developing nervous systems make them particularly vulnerable. The danger may be even greater than the new study suggests for, as Professor Mild says, 10 years is the "minimum" period needed by cancers to develop. As they normally take much longer, very many more would be likely to strike long-term users after 15, 20 or 30 years -- which leads some to fear that an epidemic of the disease could develop in the coming decades, particularly among today's young people. On the other hand, the professor points out that the amount of radiation emitted by phones has decreased greatly since the first ones came on the market more than a decade ago, which suggests that exposures and risks should also be falling. But he still recommended choosing phones that give out as little radiation as possible (see below), and pointed out that people are now also exposed to many other sources of radiation, such as masts and Wi-Fi systems, though these emit much less than mobile handsets. Britain's official Health Protection Agency -- which has taken a cautious view of claims that radiation from mobile phones, their masts and Wi-Fi installations can damage health -- admits that the study "may be indicative" of a risk, but says that "such analyses cannot be conclusive". The Mobile Operators Association said: "This is not new data for the World Health Organisation and the many independent expert scientific committees who state that there are no established health risks from using mobile phones that comply with international guidelines." Both sides agree that there is need for more research. Professor Mild said a possible link between mobile phones and Alzheimer's disease should also be examined, since "we have indications that it might be a problem" as well as a possible link with Parkinson's disease, "which can't be ruled out". In the meantime, the scientists want a revision of the emission standard for mobiles and other sources of radiation, which they describe as "inappropriate" and "not safe". The international standard is designed merely to prevent harmful heating of living tissue or induced electrical currents in the body -- and does not take the risk of getting cancer into account. Professors Hansen and Mild serve on the international BioInitiative Working Group of leading scientists and public health experts, which this summer produced a report warning that the standard was "thousands of times too lenient". The BioInitiative report added: "It has been established beyond reasonable doubt that some adverse health effects occur at far lower levels of exposure... some at several thousand times below the existing safety limits." It also warned that unless this is corrected there could be "public health problems of a global nature". Neil Whitfield, a 49-year-old father of six, developed an acoustic neuroma in 2001 after years of heavy mobile phone use, on the left side of the head, to which he had held his handset. He says he had no family history of the disease and that when he asked a specialist what had caused it, the doctor had asked him if he used a mobile. "I was on it four hours a day, easily" he says. "When I held it to my head, I could feel my ear getting warm." He adds that he completely lost his hearing in his left ear and was off work for 12 months. Unable to go back to his old job in marketing, he became a teacher, suffering a £20,000 drop in income. "It has had a devastating effect on my family," he says. 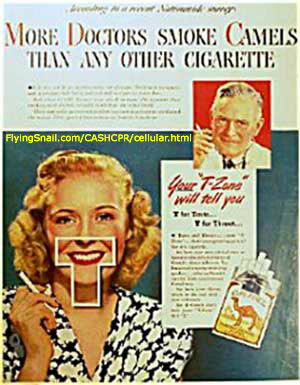 "Mobile phones are the smoking of the 21st century; they should have health warnings on them. You would never buy a child a pack of cigarettes, but we give them mobiles which could cause them harm." Exposure to radiation, shown as Specific Absorption Rate (SAR) levels, varies widely in different models. Manufacturers and the Government have ignored the Stewart report that urges they be clearly marked on phones and boxes. They are thus hard to find, though the Carphone Warehouse catalogue includes them. An easily accessible list of phones and radiation exposures is published in Germany, where low-radiation models, defined as having SAR of 0.6 or under, are encouraged. Dr. Gerd Oberfeld (MD) published an epidemioligical study earlier this year that found statistically significant increases in cancer (specifically breast and brain cancer) risk for those living near a mobile phone base station, with the most exposed showing the largest increase in risk. Sadly, the study has triggered a vitriolic response from the Austrian mobile phone industry, who are claiming that the base station never existed at the time claimed by Dr. Oberfeld. This was followed by accusations of "gross negligence" and "insecurity brought about by scaremongering", and a demand "that the author publicly retracts his incorrect cancer investigation"! These accusations are, according to Dr. Oberfeld, entirely without justification and he has no intention of retracting the study. Explaining that "As an epidemiologist, I am committed to the science and correct interpretation of the data, resulting from a study", he went on to explain that "During the preliminary research of the study by Gerd Oberfeld, a retired technician from the Post and Telecommunication Administration of Styria confirmed that a transmitter of the C-Network was operating at this location of the telephone exchange center Hausmannstätten. Furthermore, the informant could specify the precise power output of the transmitter as well as the number of channels". If it turns out that this is correct, and that the transmitter was there and has mysteriously disappeared from mobilkom austria AG's records, it would indeed be a highly embarrassing mistake. "The statement by the mobilkom austria AG that Austria needs a reliable policy for mobile phone technologies, which would investigate feared risk, without increasing panic and fear-mongering, is very much applauded by Gerd Oberfeld. It is high time that the fears and concerns of affected populations are respected, but also include scientific findings that have already been pointing in a similar direction for years, and that we search for solutions together. We may finally find a joint point of departure in this right direction!" New Delhi: The beloved cellphone without which most people feel completely powerless is actually a danger in disguise, says a leading health expert, who has called for limiting the use of the mobile phone because of it's possible cancer risk. The director of the University of Pittsburgh Cancer Institute, Dr. Ronald B. Herberman, issued the unprecedented warning to his faculty and staff on July 23. The warning is contrary to numerous studies that don't find a link between cancer and cell phone use, and a public lack of worry by the U.S. Food and Drug Administration. Herberman is basing his alarm on early-unpublished data. He says it takes too long to get answers from science and he believes people should take action now – especially when it comes to children. "Really at the heart of my concern is that we shouldn't wait for a definitive study to come out, but err on the side of being safe rather than sorry later," the China Daily quoted Herberman, as saying. In the memo he sent to about 3,000 faculty and staff, Herberman said that children should use cell phones only for emergencies because their brains are still developing. Adults should keep the phone away from the head and use the speakerphone or a wireless headset, he said. He even warned against using cell phones in public places like a bus because it exposes others to the phone''s electromagnetic fields. A driving force behind the memo was Devra Lee Davis, the director of the university''s center for environmental oncology. "The question is do you want to play Russian roulette with your brain," she said in an interview from her cell phone while using the hands-free speaker phone as recommended. "I don''t know that cell phones are dangerous. But I don't know that they are safe,” she added. AUGUSTA, Maine – A Maine legislator wants to make the state the first to require cell phones to carry warnings that they can cause brain cancer, although there is no consensus among scientists that they do and industry leaders dispute the claim. The now-ubiquitous devices carry such warnings in some countries, though no U.S. states require them, according to the National Conference of State Legislators. A similar effort is afoot in San Francisco, where Mayor Gavin Newsom wants his city to be the nation's first to require the warnings. Maine Rep. Andrea Boland, D-Sanford, said numerous studies point to the cancer risk, and she has persuaded legislative leaders to allow her proposal to come up for discussion during the 2010 session that begins in January, a session usually reserved for emergency and governors' bills. Boland herself uses a cell phone, but with a speaker to keep the phone away from her head. She also leaves the phone off unless she's expecting a call. At issue is radiation emitted by all cell phones. Under Boland's bill, manufacturers would have to put labels on phones and packaging warning of the potential for brain cancer associated with electromagnetic radiation. The warnings would recommend that users, especially children and pregnant women, keep the devices away from their head and body. The Federal Communications Commission, which maintains that all cell phones sold in the U.S. are safe, has set a standard for the "specific absorption rate" of radiofrequency energy, but it doesn't require handset makers to divulge radiation levels. The San Francisco proposal would require the display of the absorption rate level next to each phone in print at least as big as the price. Boland's bill is not specific about absorption rate levels, but would require a permanent, nonremovable advisory of risk in black type, except for the word "warning," which would be large and in red letters. It would also include a color graphic of a child's brain next to the warning. While there's little agreement about the health hazards, Boland said Maine's roughly 950,000 cell phone users among its 1.3 million residents "do not know what the risks are." All told, more than 270 million people subscribed to cellular telephone service last year in the United States, an increase from 110 million in 2000, according to CTIA-The Wireless Association. The industry group contends the devices are safe. "With respect to the matter of health effects associated with wireless base stations and the use of wireless devices, CTIA and the wireless industry have always been guided by science, and the views of impartial health organizations. The peer-reviewed scientific evidence has overwhelmingly indicated that wireless devices do not pose a public health risk," said CTIA's John Walls. James Keller of Lewiston, whose cell phone serves as his only phone, seemed skeptical about warning labels. He said many things may cause cancer but lack scientific evidence to support that belief. Besides, he said, people can't live without cell phones. "It seems a little silly to me, but it's not going to hurt anyone to have a warning on there. If they're really concerned about it, go ahead and put a warning on it," he said outside a sporting good store in Topsham. "It wouldn't deter me from buying a phone." While there's been no long-term studies on cell phones and cancer, some scientists suggest erring on the side of caution. Last year, Dr. Ronald B. Herberman, director emeritus of the University of Pittsburgh Cancer Institute, sent a memo to about 3,000 faculty and staff members warning of risks based on early, unpublished data. He said that children should use the phones only for emergencies because their brains were still developing and that adults should keep the phone away from the head and use a speakerphone or a wireless headset. Herberman, who says scientific conclusions often take too long, is one of numerous doctors and researchers who have endorsed an August report by retired electronics engineer L. Lloyd Morgan. The report highlights a study that found significantly increased risk of brain tumors from 10 or more years of cell phone or cordless phone use. Also, the BioInitiative Working Group, an international group of scientists, notes that many countries have issued warnings and that the European Parliament has passed a resolution calling for governmental action to address concerns over health risks from mobile phone use. But the National Cancer Institute said studies thus far have turned up mixed and inconsistent results, noting that cell phones did not come into widespread use in the United States until the 1990s. "Although research has not consistently demonstrated a link between cellular telephone use and cancer, scientists still caution that further surveillance is needed before conclusions can be drawn," according to the Cancer Institute's Web site. Motorola Inc., one of the nation's major wireless phone makers, says on its Web site that all of its products comply with international safety guidelines for radiofrequency energy exposure. A Motorola official referred questions to CTIA. San Francisco moved a step closer Tuesday to becoming the first city in the nation to require that retailers post in their stores notices on the level of radiation emitted by the cell phones they offer. The Board of Supervisors voted 10-1 to give preliminary approval to the proposal. Final approval is expected next week. Supervisor Sean Elsbernd was the lone vote in opposition. Mayor Gavin Newsom, an early proponent of the legislation, plans to sign it into law when it reaches his desk. Cast by backers as a pro-consumer measure, the ordinance would not ban the sale of certain cell phones but would require retailers to provide the "specific absorption rate" - a measurement of radiation registered with the Federal Communications Commission - next to phones displayed in their shops. Consumers also would be notified about where they can get more educational materials. "This is about helping people make informed choices," said Supervisor Sophie Maxwell, chief sponsor of the legislation. But a trade group for the cell phone industry said the law could lead to confusion. "Rather than inform, the ordinance will potentially mislead consumers with point-of-sale requirements suggesting that some phones are 'safer' than others, based on radio frequency emissions," John Walls, vice president of public affairs for the Cellular Telecommunications and Internet Association, said after the vote. "In fact, all phones sold legally in the U.S. must comply with the Federal Communication Commission's safety standards for (radio frequency) emissions." The FCC has adopted limits for safe exposure to radiation. The measurement shows the amount of radio frequency energy people absorb in their bodies when talking on a cell phone. The potential long-term health impacts of cell phone use, particularly on the brain, is still a matter of scientific debate. A similar right-to-know measure, carried by state Sen. Mark Leno, D-San Francisco, died in the Legislature this year amid heavy lobbying by the cell phone industry. Small business advocates in San Francisco also lobbied against the local labeling law, saying they didn't have an appetite for more government mandates, particularly in this tough economic climate. "This is not about discouraging people from using their cell phones," said Newsom spokesman Tony Winnicker. "This is a modest and commonsense measure to provide greater transparency and information to consumers." The posting requirements would be phased in, beginning in February. Violators would face fines of up to $300. City officials still need to educate retailers and figure out how the law would be enforced, when and if it is finally adopted. Hundreds of stores in San Francisco sell cell phones. Renee Sharp, director of the California office of the Environmental Working Group, a national nonprofit research and advocacy group, lauded San Francisco for its "leadership in protecting the public's health and right to know, and we hope it's the beginning of a movement that won't stop until everybody shopping for a phone has easy access to this information." This page will grow and new information will be posted. Thank you for visiting and please check back from time to time = = RSS to be added soon.